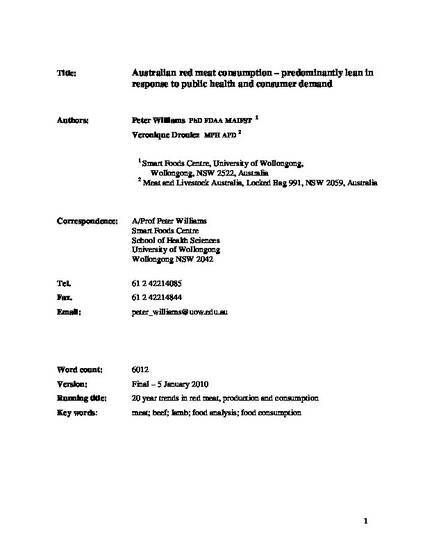 This article was originally published as Williams, PG and Droulez, V, Australian red meat consumption : predominantly lean in response to public health and consumer demand, Food Australia, 62(3), 2010, 87-94. Introduction and Methods: Trimming fat off meat is recommended for reducing intake of saturated fat. This paper reviews trends over the past 20 years that have influenced the red meat supply in response to consumer and health professional demands for lean meat, drawing on published survey data, marketing information, analyses of meat content and qualitative research commissioned by Meat and Livestock Australia. Results and Discussion: Separable fat is the greatest determinant of the saturated fat in Australian red meat, and changes in the processing and butchering practices have combined to produce red meat today with significantly lower separable fat. Nutrient analyses in 2002 showed the separable fat on raw retail samples was up to 38% less than in comparable cuts in 1983. Further trimming by consumers prior to consumption is also increasing and in 2007 89% of consumers reported buying meat trimmed or removing some or all fat prior to consumption. The 1995 national nutrition survey showed red meat contributed less than 10% of dietary saturated fat intake in Australia, and continues to make an important contribution to intake of iron, zinc, omega 3 and vitamin B12 intakes, as well as encouraging consumption of vegetables. Conclusions: Dietary messages and strategies for reducing saturated fat intake have increased fat trimming practices by retailers as well as consumers. Consequently, trimmed red meat is not a major source of saturated fat in the Australian diet. Dietary advice and analyses should ensure data reflects red meat as consumed rather than as purchased to avoid overestimating total and saturated fat intake.